Former First Lady of US, Nancy Reagan passed away at the age of 94 years at her home in Bel-Air, LosAngeles. As per a statement from her office the cause of her death was congestive heart failure. 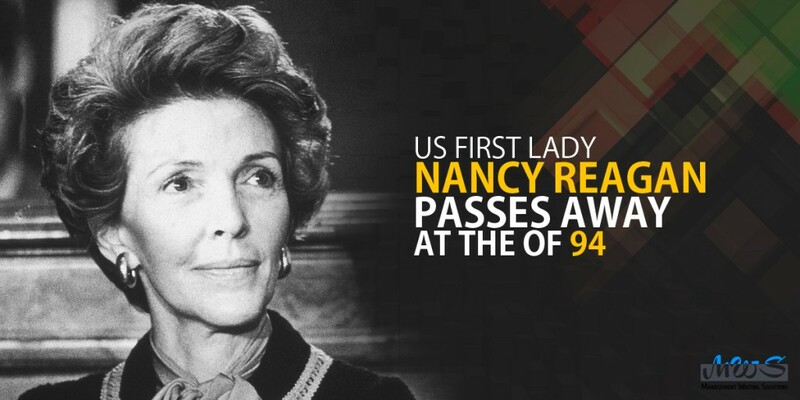 She will be buried beside her husband, former US President Ronald Reagan at the Ronald Reagan Presidential Library in Simi Valley in California. The president had passed away in June, 2004.Nancy Reagan was a B movie actress who married the President who at the time was the president of the Screen Actors Guild. She married the president in 1952 and was the First Lady of California from 1967-75, when Mr. Reagan was the governor of the state. She then became the First Lady of US from 1981-89. The two had two children together called Ron and Patti. During her time in the White House she is best known for her campaign against drug abuse called “Just say no”. Due to the assassination attempt against her husband in front of the Hilton Hotel in Washington DC, she became fiercely protective of him which kept increasing with the passage of time. Things took a shoddier turn when she began consulting an astrologer to determine which dates were safe for her husband to leave the White House and which were not, and this also influenced the President’s duties and schedules. Such star gazing practices often led to several clashes with the Presidents Chief of Staff, Donald Regan which later turned into a bitter power struggle that finally ended with the latter’s resignation. Many were also critical of her over-spending during her time in the White House as she had an obsession with expensive fine China. But Mrs. Reagen was a loving wife who cared for her husband during his decade long struggle with Alzheimer’s. She even departed ways with the Republicans and supported a stem cell research program to find a cure for the disease in the recent years. Following the official news of Mrs. Reagan’s death, President Barack Obama sent his condolences to the Reagan family which said that “it is prayerful that the lovely Mrs. Reagan is reunited with her beloved husband once again”. Former president Jimmy carter also sent his condolences and paid tribute to the woman whose husband ousted him from the White House. His tribute said – “President Reagan has reunited with his loving wife and partner but Americans and the Reagan family has lost a woman of great strength and grace”.